A first leap into the realm of budget electric standing desk converters ends in an underwhelming performance, but we expect more of these low-cost options to arrive on the market soon. Our advice? Stay tuned for better budget options or opt now for a manual design. The $269 price tag does impress, but as the old adage goes "you get what you pay for", and in this case it's remarkably cheap manufacturing and poor ergonomic design. At the end of the day, many of the top-rated manual standing desk converters out there—which still represent 99.9% of the market—have higher lift capacities, more surface area, come fully assembled, are far more rigid, and likely to be more reliable in the long run. For the best budget converters, we recommend sticking with the manual lifts. Originally launched out on Kickstarter with a $249 SmartDesk standing desk, Autonomous made a quick reputation for itself as a high-volume, low-quality producer of cheap desk products that didn’t exactly stand the test of time well. Their marketing has targeted younger, perhaps more impulsive consumers, who think the low price is IKEA-cool, and who are not likely to invest much time in comparison shopping. As you can read in our review of their original Autonomous SmartDesk product, Autonomous the company has had a penchant for making very broad marketing claims of “state-of-the-art design” that don’t hold up to scrutiny. In fact, a quick search of social media outlets evidences a laundry list of historical problems with both product quality and infuriating customer service issues. The growth-crazed company has managed to stay one step ahead of their reputation by literally bribing millennials to post massive numbers of paid positive reviews of their product in social media, in an attempt to drown out the negative user reviews. Quality problems with the next-generation SmartDesk 2 seem to be getting a little better over time as they change from one commodity Chinese component supplier, Jiecang, to another, Aoke, but their prices keep going up each time they make these badly needed improvements (no surprise there), with a minimally-outfitted, dual-motor standing desk now running $449—only a couple of hundred dollars less than you can get a much higher-quality, American-made standing desk with a ten-year warranty. The StandDesk Pro is another made-in-China option that is the most popular SmartDesk alternative for only a few bucks more, and they also offer a ten-year warranty. Indeed, Autonomous' website and social media marketing campaigns are very millennial-friendly, with big buttons for “Buy Now” that go straight to credit card capture after picking only from an exceptionally limit set of size and color options. Minimal technical information is offered to confuse the buyer with too much information, and many of those specs are grossly hyper-inflated based on our testing. More mature consumers tend to do a lot more comparison shopping but let’s face it, the younger set is going to be very attracted by the price and glitzy marketing spin, and often skip the research. And they no longer just sell desks. Autonomous has rushed to bring out a host of Chinese-made OEM knock-offs of everything from active stools and file cabinets to bike desks and standing mats—claiming all along the way that these are innovative new designs. The founder has infamously boasted to industry pundits that his objective is to “put every other furniture maker out of business” and grab a huge market share with his scorched earth pricing strategy. And lately, founder Duy Huyhn has shifted focus from just office furniture to turning Autonomous in a marketplace for hundreds of cheap Chinese knock-off products, from scooters to AR goggles to, well, you name it... he wants to be the consumer-direct Alibaba, US-China trade imbalance be damned. 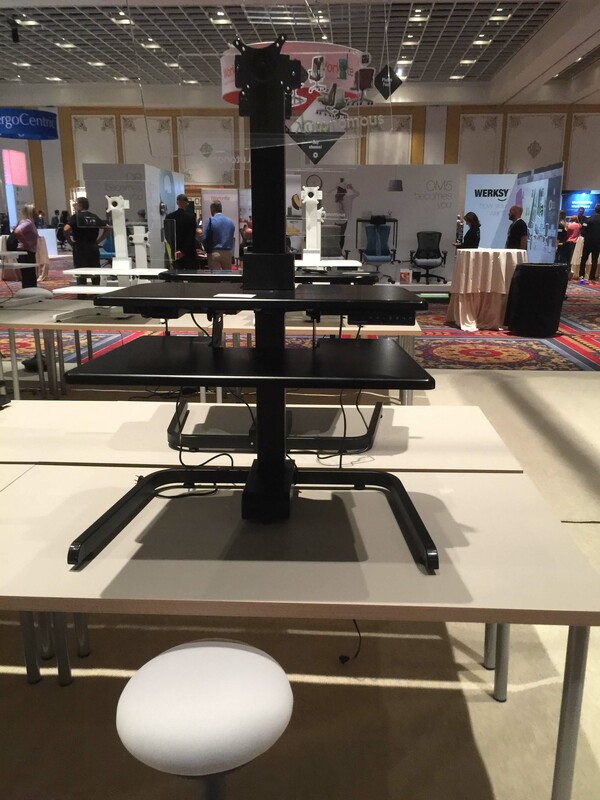 Our editorial staff routinely checks in with almost every manufacturer in the office fitness industry, as we recently did at the ErgoExpo conference in Las Vegas where we first saw the SmartDesk Mini standing desk converter. While most industry CEOs aren’t thrilled with Autonomous’ “race to the bottom” pricing strategy, the brunt of the impact seems to have been taken on the chin of other millennial-targeting marketers of cheap Chinese-made desks. Core industry players who target more mature customers are capable of paying a little more for quality, reliability and hassle-free customer service continue to report exceptional year-over-year sales growth, and to not have felt much of a ripple from Autonomous’ splashing about at the other end of the pool. So with that as a backdrop, let’s get to our expert reviewers’ impressions of the new SmartDesk Mini desktop riser product. We got a chance to test the product out at the August 2017 ErgoExpo conference in Las Vegas (see our round-up report on the ErgoExpo show). 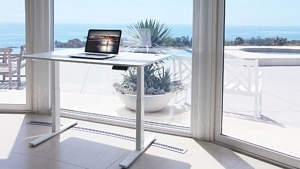 At $269 for an electric standing desk converter Autonomous is clearly making a play to steal market share from Varidesk—and their 75+ competitors—in this burgeoning category. Converters are a hot commodity because many customers don’t have the budget for a full sit-stand desk, but can squeeze enough coin to get standing with a lower-cost converter. They’re also popular with people who have built-in counters, or don’t want to give up their desk drawers, but the vast majority of converter buyers are looking for a budget deal. One thing that clearly separates the lower-cost converters from those that cost slightly more is that in this price range you’re going to be putting it together yourself. Whereas units like the Varidesk Pro, iMovR ZipLift, and Ergotron Workfit-T all come pre-assembled and ready-to-go, units like the Autonomous SmartDesk Mini and the very popular Flexispot desktop risers require assembly by the user. Being electric, this SmartDesk Mini actually requires about as much assembly skill as one of their full desks (and a good set of tools). In fact, the main post is actually just an upside-down leg from the Home Edition of the SmartDesk Standing Desk (it’s even called a ‘leg’ in the assembly manual, despite the fact that it’s above the desk, not below it). Two popular (and highly-rated) electric standing desk converters, the Winston-E and the Kangaroo Electric are excellent alternatives to the Autonomous SmartDesk Mini. But quality comes at a price. So along with the overall quality risk of “you get what you pay for,” there’s the risk that something may not go right with assembling the product, leaving you with the hassle of calling support, swapping parts in the mail, or attempting to return the unit. To be fair, other electrics (much pricier) like the highly-rated Winston-E and Kangaroo Pro Electric, require some assembly, too, but they have a fine track record when it comes to product quality and support. Based on Autonomous’ track record, we’re a bit more cautious on the matter, and recommend downloading their assembly manual ahead of purchase to see if you’re comfortable with the complexity of its assembly. Is There a Single Ergonomist on the Autonomous Design Team? We want to be appalled by this next discovery, but we have to keep it in context that this is, after all, a $269 converter. You probably shouldn’t expect everything you’ll find on pricier products. One of our reviewers had a perturbing discussion with one of the Autonomous sales reps at the show, who didn’t appear to understand that having an independent monitor arm adjustment is vital for most people over 5’4” tall. He did not seem aware that most people need more distance between the keyboard and monitor heights when their torsos stretch out as they stand. Ergonomics 101. While you can technically change the height of the monitor versus the keyboard height this is not a trivial matter. It involves reaching around behind the monitor and turning two knobs to loosen the mount, sliding your monitor up or down, and retightening. All while reaching over the entire unit. Bottom line, this essential ergonomic feature is completely missing from the design of the SmartDesk Mini, and the sales force doesn’t even understand why anyone would want it. To have an electric lift yet lack an independent monitor height adjustment just seems remarkably odd to us—but what could we possibly know? We’ve only lab tested several dozen standing desk converters ever since the introduction of the first Varidesk in 2013. The sales rep insisted we were wrong. Sure, whatever. Ironically, the Mini has the same digital hand controller as the full SmartDesk II standing desk, with four programmable height presets. So while two people can ostensibly share the same workstation, each with their own sitting and standing height presets, the monitor height will also have to be shared between them. But hey, it might work for two co-workers who happen to have the exact same build. The SmartDesk Mini lacks any sort of tilt adjustment on the keyboard tray. In fact, like the Varidesk, under its own weight it seems to have a slight tilt in the wrong direction, which is evidenced when the work surface is brought down to sitting position (see the video on the Autonomous Youtube channel). With units like the ZipLift+ ($299 including standing mat) offering +10° to -15° of keyboard tray tilt adjustment, this is a now-popular feature request we’re surprised Autonomous overlooked. "Gangly, yet underpowered" is how we describe the look of the Autonomous SmartDesk Mini. The overall aesthetic of the SmartDesk Mini can probably best be described as “gangly, yet underpowered.” It makes quite the footprint on your desktop, with a large U-shaped “foot” that rests on the desk with no clamping. It seems to be relatively stable but we do wonder how stable it is given the rear-heavy design approach. No worries if your desk is up against a wall, but it’s a concern if it’s out in the open where there’s nothing to prevent an unfortunate bump from taking your entire workstation down to the floor. Surprisingly, the unit weighs less than any of the popular (manual) Z-lift standing desk converters on the market, adding to our stability concern. Its impressive 23” high reach, which should be good enough for any NBA player, also makes the unit’s un-clamped stability a question if actually used at that height. Prior to the arrival of the Autonomous SmartDesk Mini most of the electric standing desk converters we’d tested had been very high-end, designed for the executive desk or for someone lugging three or four monitors up and down. These are usually hefty beasts with lots of lifting power and plenty of stability. The SmartDesk Mini, though, has only a relatively measly 33 lb lift capacity after subtracting the weight of its own steel and wood componentry. And its height changes are relatively slow as compared to most electric desks and electric desktop risers, at only 1 inch per second. It appears the main compulsion for Autonomous’ choice of electric may have been easy access to the actuator leg that they already make in very high volumes, and possibly the lack of talented mechanical engineers to design something as good as the top competitors in the manual category (sans the aging Varidesk design, which we can’t really call top-notch anymore). With Varidesk going around suing a lot of its competitors over patent infringement, it may also have been a strategy for avoiding potential hassles with their main competitor. At the end of the day, many of the top-rated manual standing desk converters out there—which still represent 99.9% of the market—have higher lift capacities, more surface area, come fully assembled, are far more rigid, and likely to be more reliable in the long run. They’re also quieter (at least the ones built with gas struts, not springs), don’t require a power outlet, and they change height in one second rather than 1”-per second. Some also have ergonomic features like tilting keyboard trays and depth-of-field adjustment on their monitor mounts. Autonomous probably figured their millennial audience will be wowed by the cool factor of electric, and won’t likely research how much more assembly effort and success risk the Mini might entail. Our advice? Stick to the more ergonomic, proven models already out there, and recognize the electric gimmick for what it is in the case of the Autonomous SmartDesk Mini. See more lab-tested standing desk converters. For full-sized sit-stand desks see our experts' lab test reviews in the Best Electric Height-Adjustable Desks round-up. You can also check out our reviews of other Autonomous products, the main line SmartDesk 2 Standing Desk, the upgraded SmartDesk First Class Desk, the AI-peppered SmartDesk 3 Standing Desk, and the SmartDesk Mini Standing Desk Converter.